Chest CT is one of the most commonly performed CT exams in the United States. According to a 2009 report by the National Council on Radiation Protection and Measurements, chest CT is the third most common body region for which CT scans are ordered, behind abdominal and pelvic scans. Radiologists recognize the need to minimize radiation dose for all exams but believe that dose reduction is particularly important when performing chest CT because the imaging procedure exposes some of the most radiosensitive organs in the human body, including the breasts, lungs, and thyroid. In a series of articles in the Journal of the American College of Radiology, researchers from The Russell H. Morgan Department of Radiology and Radiological Sciences at Johns Hopkins Hospital in Baltimore and Massachusetts General Hospital Imaging of Harvard Medical School in Boston have outlined strategies for optimizing radiation dose. The first article, published in October 2010, discussed features to consider when selecting a new CT scanner. The second article, published this past May, detailed how to reduce CT radiation by modifying primary scanning factors such as tube current, tube potential, and pitch factor. The following month, the authors discussed optimizing CT dose with automatic exposure control techniques. In August, they wrote about optimizing dose protocols in head CT. 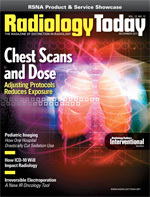 The most recent article, which ran in the September issue, focuses on optimizing radiation dose in chest CT protocols. “I think the chest is clearly one region where one can substantially reduce dose and still maintain image quality needed for diagnoses,” says Mannudeep K. Kalra, MD, an assistant professor at Harvard Medical School who coauthored the chest CT paper. The authors’ first suggestion for reducing dose applies to all regions of the body being scanned, not just the chest. “Regardless of the body region being scanned, dose reduction must always start with making sure that there is justifiable clinical indication for CT scanning,” says Mahadevappa Mahesh, MS, PhD, an associate professor of radiology at Johns Hopkins who coauthored the chest dose reduction article. In all cases, Mahesh says, chest radiographs produce substantially lower radiation doses than chest CT and may yield appropriate imaging data. In some situations, such as for masses in the mediastinum, he says thoracic MRI can offer similar or better information and poses no radiation risk. “CT chest exams have been a boon to doctors in the last 12 to 15 years,” Mahesh says, largely because the results are quick and revealing. “It is so fast for the patient, it is almost as if by the time they lie down on the scanner table, the scan is done.” But physicians should not order a chest CT simply because the results can be available quickly, he warns. If it’s determined that CT is the most appropriate imaging modality for a patient, it is also important to understand the type of scanner that would be used and its particular strengths. For example, Mahesh says, some multiple detector row CT scanners offer a high-pitch scanning mode and partial iterative reconstruction techniques or other features. Radiologists can take advantage of these techniques if they know they’re available, he says. At the same time, “It’s also important to know that you can’t copy scanning protocols from one type of scanner to another,” he says. Mahesh and his colleagues recommend using the automatic exposure control feature that most CT scanner manufacturers have developed in the last five to six years. “The scanner will automatically sense the thickness of the patient and automatically adjust the parameters and deliver the minimally necessary or required dose,” Mahesh says. By taking advantage of this feature, “You don’t use the same dose for larger or denser patients as you do for smaller or thinner patients.” It is important when using this feature that the patient be positioned at the center of the scanner. “Most scanners do this remarkably well,” Mahesh notes. To further help reduce dose, it’s important to give good instructions to patients undergoing chest CT exams, the researchers found. “This cannot be overemphasized,” Mahesh says. Technologists operating the scanners must make sure that the patients understand and follow their breath-hold instructions and avoid moving during scanning. Centering the patient in the CT gantry isocenter is key, especially when using automatic exposure control features, because positioning the patient off center can increase the surface radiation dose as well as reduce image quality, Mahesh says. When patients follow directions, it avoids longer exposure and helps eliminate the need to repeat an exam; faster gantry rotation times of 0.4 to 0.5 seconds can be used when available to help minimize breathing artifacts and pulsation artifacts, he notes. Yet another way to reduce radiation exposure with chest CT is to limit repeating the exam with and without contrast, Mahesh says. In most cases, he says, it’s not necessary to do both. If a second CT with contrast is indicated, he says, it may be possible to limit the second exam to the region of interest as opposed to the entire chest region, thereby reducing dose. “Dose reductions also can be obtained with the use of iterative reconstruction techniques, but careful understanding of the functionality of respective techniques from different vendors is key,” Mahesh says. Another option for reducing radiation dose is to acquire thin sections and then reconstruct thicker images with multiplanar reformats to reduce image noise and improve image quality, he says. Some CT chest studies, including those looking for early or subtle changes indicating diffuse lung disease, require that the images be acquired in three phases: while the patient is in a supine inspiratory position, an expiratory position (for air trapping), and a prone position. In those studies, Mahesh says, it’s important that the acquisition of images in the three phases not triple the radiation dose of a single-phase chest CT. In most cases, Mahesh says, the initial inspiratory phase CT can be a volumetric helical acquisition; an axial or step-and-shoot mode can be used for the expiratory phase; and the prone images can be acquired at 2-cm intervals from the lung apices to the base at the low tube current. Reducing radiation dose in chest CTs for pediatric patients is especially important because children are at greater risk of long-term exposure. Many of the same dose reduction principles can apply, Mahesh says. Pediatric chest CT should be performed at lower radiation doses compared with chest CT in adult patients and at even lower radiation doses compared with abdominal CT in children. When determining dose, the size of the child is an important consideration. Scan length time for all pediatric chest CT exams should be restricted to the lungs only, according to Mahesh. “The scan should not be extended to cover the adrenal glands,” he says. The use of iterative reconstruction and high-pitch scanning modes can allow further dose reduction in pediatric chest exams as well as adult exams. Automatic exposure controls also can be used for most CT exams in children, Mahesh says. And as with adults, it is important when using automatic exposure controls that pediatric patients are in the isocenter of the scanner. In recent years, Mahesh says, the radiology community has spent time arguing whether radiation exposure from diagnostic exams is too great to cause any effects. “It doesn’t really matter whether there is a risk or not,” he says. “We have an obligation to keep the dose as low as possible but yet not jeopardizing the image quality.” With chest CT, he says, radiation dose reduction can be easily achieved by tweaking scanning protocols and techniques based on a patient’s age and size, the clinical indications for the exam, and any follow-up studies. Kalra says some imaging services advertise their state-of-the-art equipment to get patients to use their facilities, but they also should emphasize that they are using the latest dose reduction techniques, whether it’s for chest CT or another region of the body.